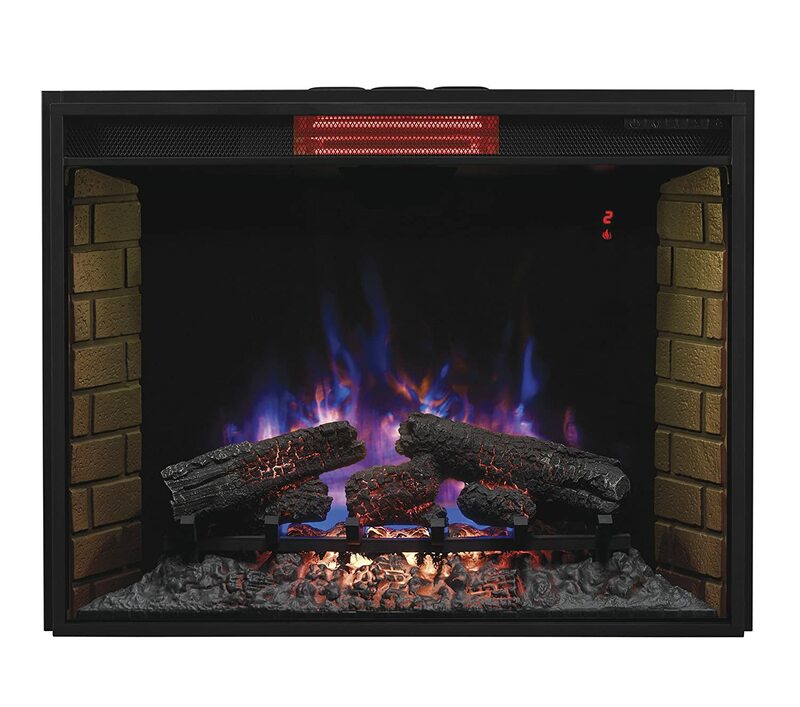 You may have come across infrared heaters before if you have been looking at electric fireplaces. This post will explain how infrared heaters work, and their advantages and disadvantages so you can decide if an infrared heater is right for you. They work in the same way that the sun does. You cannot see infrared light, but it gets absorbed in our skin and other objects such as our clothes and the things around us. This absorption is what leads to the heating effect as the objects struck by the light will warm up. An infrared heater will only warm up objects that are in front of it. Imagine sitting in the sun for a while compared with sitting in the shade for a similar length of time. Sitting in the sun would obviously be warmer, as you are directly exposed to the sun’s rays. When you are in the shade you block out most of the rays. These heaters are normally powered by electricity, but they can also work on propane or natural gas. Each heater will have different specifications such as heat output, beam coverage and they way that they are controlled. This is very different to the way a fan forced heater works that you will find in a lot of electric fireplaces. The fan will blow air over a heating element and this heats up the air around it, and fairly quickly a whole room is heated. The fan makes the whole process quicker. If there is no fan, then the heater will heat the room up but it will take a lot longer. When an infrared heater is switched on it will immediately send out a precise beam of heat particles which will warm you up straight away. This is different to conventional heaters that use convection to heat the circulating air in the room over time. So you get instant warmth with heat rays that will dispel the cold immediately. The rays are directed at you, so if you are sitting in an office or in your chair at home you will immediately feel the benefit. The heater will not heat up the whole room as it is focused on you and the objects immediately in the beam’s path. An infrared heater will never reduce the oxygen or humidity in a room, and is therefore healthier than other heaters that do this. Your skin and your sinuses will never be dried out by an infrared heater either and they will not cause a build up of static electricity. There is no need to worry about UV radiation, as the heaters do not produce UV rays that can be very dangerous like the natural sun does. The heat from an infrared heater has been proven to help people with their blood circulation as well. These heaters are actually kind to the environment as well. They will never create any smoke or fumes or any other kinds of pollution. There are no flames or any form of carbon combustion going on in an infrared heater. Nothing is added to the air and nothing is taken away from the air. The heat source within an infrared heater is wrapped over by hot coils, which ensures that there is a even transference of heat. This is then reflected by a highly polished metal so that it will extend quite a distance. This leads to a very comfortable and gentle heating effect. Infrared heaters are very efficient as they will only heat objects and specific areas. The whole room is not heated, and there is no need to switch the heater on for a few minutes first as the heat is instant. Almost all of the heat created is emitted out, and a lot of the heaters will only use around 300 watts of power so you will save money too. If the noise of a fan forced heater would be annoying for you after a while, there are no such problems with an infrared heater. There are no fans because all it does is emit a beam of heat. These heaters are great for the bedroom as your sleep will never be disturbed. There are no motors or other moving parts in an infrared heater so you won’t wear out anything by using it. You won’t need to lubricate anything or change any parts. All that is needed is the occasional cleaning of the metal reflectors to keep your heater working efficiently. It is advisable to keep children and pets away from infrared heaters as the coils used get very hot and could cause burns. Manufacturers are taking this seriously, and are looking for ways to increase the safety of their infrared heaters. Now it is possible to get infrared heaters that are enclosed in cabinets which are cool to the touch, and they use a fan to disperse heat. Some other improvements include switches that activate to turn off the heater if it is tipped over, and an automatic shut off facility. Just as it starts to heat the second it is turned on, the heat will disappear straight away once the heater is turned off. Remember that you are not heating up the entire room with an infrared heater. Other types of heater will still heat the room for a while once they are turned off. It might not suit everybody that the heater only heats what is in front of it. If people are moving around a room then they will not feel the benefit of the heat. These heaters use radiant heat, and this only travels in a straight line. There are some infrared heaters that have a wide enough beam to heat entire rooms, but they will still work best on things that are directly in the beam’s path. Click text link to go to full review. Click Image for current discounted price and more images. 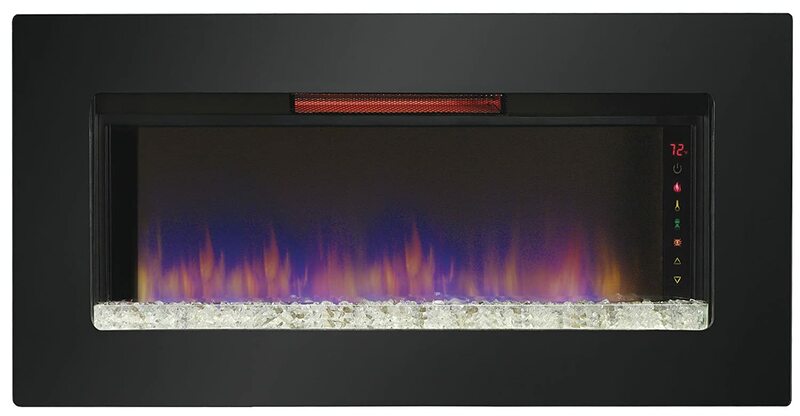 Virtually every type of electric fireplace comes in an infrared version. Here is a representation of infrared electric fireplaces. Before you invest in an infrared heated fireplace check the specification and the coverage area of the beam. These heaters are more economical and healthier than other heaters, but you need to remember that the air in the room will not be heated. 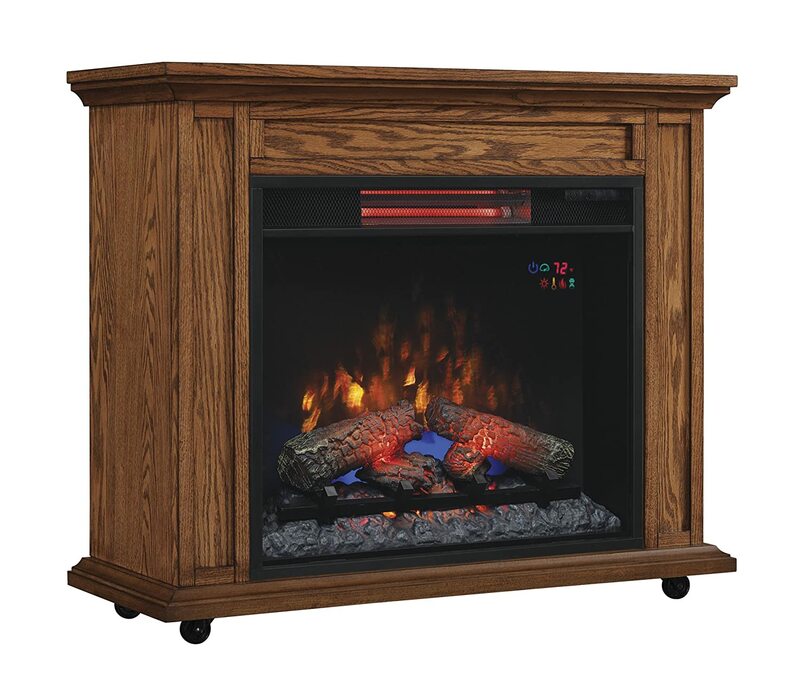 What distance would you recommend keeping furniture at from a infrared fireplace? We are thinking of purchasing a tv unit with a fireplace in it. Any distance is fine as ther is no ‘forced air’ heat. i fell asleep in front of the heater 4 foot from my face directly, maybe a little over an hou, r and the beam was on me at the end of the bed, my lungs felt hyperinflated, can you tell me if that is safe? Been a little hard to breath all day?